Residence Chryseis is located 200 metres from the Palais des Festivals et des Congrès and the Croisette Beach. It offers lift-accessible apartments and free Wi-Fi. Apartments at Residence Chryseis surround a patio and are soundproofed and air-conditioned. Each apartment is equipped with a flat-screen TV with satellite channels, a private bathroom and kitchen with microwave and oven. 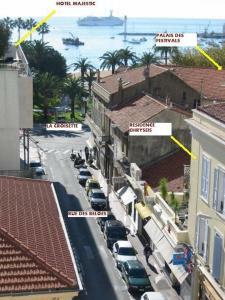 Chryseis Residence is 50 metres from Cannes’s train station and 30 km from Nice Côte d'Azur Airport.